NASA's prolific Kepler spacecraft is back in action, a year after being sidelined by an equipment failure. 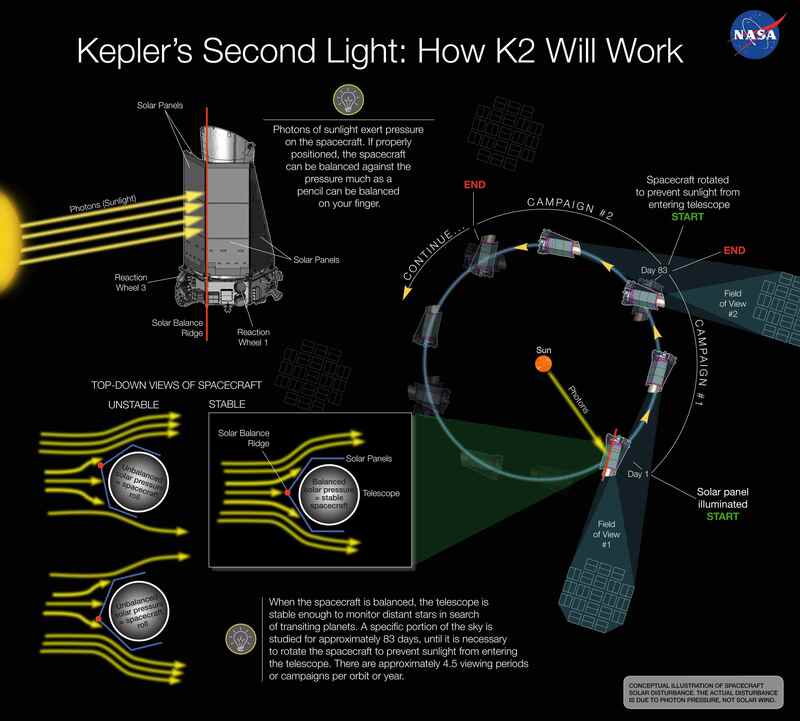 The space agency has approved a new mission called K2 for Kepler. The telescope's original exoplanet hunt was derailed in May 2013 when the second of the spacecraft's four orientation-maintaining reaction wheels failed, robbing it of its precision pointing ability. During the K2 mission, Kepler will stare at target fields in the plane of Earth's orbit, known as the ecliptic, during observing campaigns that last about 75 days each. In this orientation, solar radiation pressure can help balance the spacecraft, making the most of Kepler's compromised pointing ability, team members said. "The team is currently finishing up an end-to-end shakedown of this approach with a full-length campaign (Campaign 0), and is preparing for Campaign 1, the first K2 science observation run, scheduled to begin May 30," Sobeck wrote. The $600 million Kepler mission launched in March 2009, on a four-year mission to determine how commonly Earth-like planets occur throughout the Milky Way galaxy. Kepler finds alien worlds by noting the tiny brightness dips caused when the planets cross in front of their parent stars from the instrument's perspective. The mission has been incredibly successful, detecting more than 3,800 potential exoplanets to date. Follow-up observations and analysis have confirmed about 960 of these, meaning that Kepler has found more than half of all known alien planets. And mission scientists expect more than 90 percent of the mission's candidate planets will turn out to be the real deal. NASA issued a call for new Kepler mission proposals last August, about three months after the spacecraft lost its second reaction wheel. The K2 proposal advanced to a NASA vetting stage called "senior review" in December. The agency conducts senior reviews every two years; the last one that evaluated astrophysics missions took place in April 2012. The 2014 senior review looked at the Hubble, Chandra, Fermi, NuSTAR, Spitzer, Suzaku, Swift, XMM-Newton and WISE space missions, in addition to Kepler, NASA officials have said. It currently costs about $18 million annually to operate Kepler and analyze its data.